Source: Durham Bull, photo by Donald Burgess Tilley Jr. This statue depicts a bull, a symbol for Durham since the 1800s, and stands 10 feet tall. The monument reinforces the strong qualities of the city and its inhabitants, even in the face of negative perceptions of the area. It is located downtown Durham. The Central Carolina Bank Plaza and "Major," the bronze bull sculpture, were given to the citizens of Durham through a grant from the Central Carolina Bank in memory of George Watts Hill. A World War II veteran, Major Hill was Bank President and Chairman of the Board for 61 years. A visionary, business leader and philanthropist, his ideals had a profound impact on out city and the State of North Carolina. A strong support of the arts, it was his belief that through the arts he would improve the quality of life for all citizens of our state. Although banking was his life's work, in his heart he was an architect and renaissance man - known to his friends as "Major." Durham Non-Profit Liberty Arts, Inc. 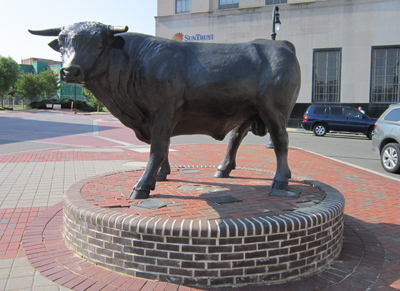 The bull has been a symbol associated with the Durham area dating back to the 1800s, when in the post-Civil War era the merchant John R. Green branded his product “Bull” Durham Tobacco. At Green’s death in 1869, William T. Blackwell purchased the name and trademark. Subsequently, in 1898, James B. Duke bought the tobacco company, making it a part of his American Tobacco Company, thus increasing Durham’s national reputation as a tobacco-manufacturing center. Durham has been known as the “Bull City” ever since. Many individuals who have observed the statue have pointed out the prevalence of the bull’s testicles. The statue is located in downtown Durham, in the City Center Plaza. Since the dedication of this monument, there have a string of sculptures dedicated in the downtown Raleigh and downtown Durham areas that, much like the bull statue, are commemorations of the characters of the cities, rather than monuments dedicated to specific people or event. 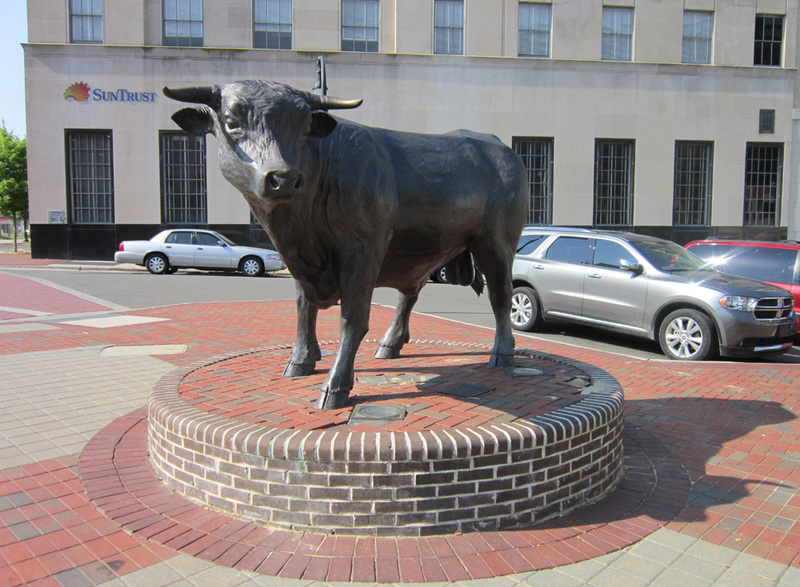 During the “Occupy” movement in 2011 the bull statue served as a rallying area for the Occupy Durham protests. CCB commissioned to have the George Watts Hill Pavilion built (it was dedicated on October 24, 2003), and selected the bronze bull statue project to be the pavilion’s first undertaking. All materials and costs were donated by CCB.